The GMO labeling initiative is spreading through our states like wild fire and it gladdens my heart to see support for honest and transparent labeling throughout our country. This fire is getting to big to simply throw a bit of salt on and I am anxious for the day that the truth is revealed on all labels. Hell, if I had my wish, I’d want to see exactly every component of anything in the food my family eats – right down to the spelling out of “natural ingredients” and other Trojan horses. Many people don’t pay much notice to the ingredients listed on foods, however awareness of this issue is catching some attention and more Mothers are scrutinizing food every day. More individuals are looking behind the veil of advertising to uncover the basic facts of a food product’s ingredients. If you or one of your children has a food allergy or intolerance, chances are reading the ingredient portion of a label is old hat. 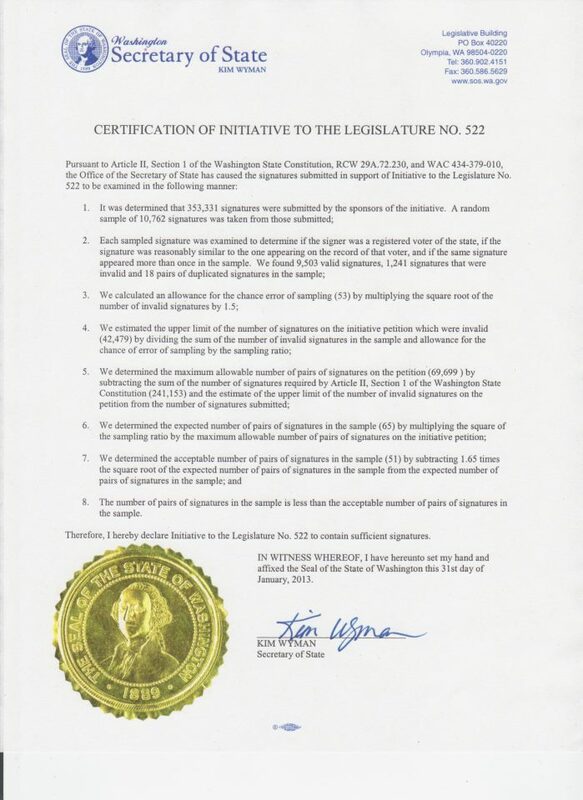 In Washington, I-522 is taking some heat from the NorthWest Food Processors Association. The scare tactics employed are very familiar having recently gone through the advertising blitz attacking Prop. 37 in California, where I reside. They’ve already implemented the cost threat, “The cost of compliance will be felt by consumers and will disproportionately impact small- to medium-sized businesses in our region, putting local jobs at risk.” Oh, I like how they worked the impossible issue of unemployment into this tactic. Bravo to the PR spinners at Monsanto for this sly twist. Look, the truth is that cost seems to be one of the hardest issues for many people to get over. None of us like the threat of spending more on any factor – let alone, when it comes to food – our most basic fuel for human life. Sadly, I know that it’s hard to overcome the threat of increased cost. I know, because I feed a hungry five-person army that’s more man-boy-teenager power than dainty rabbits. If I eat organic I must spend more on food, but I’m going to spend less in other areas because it truly balances out. We can’t afford to eat healthier, I can barely afford my groceries now. But you know what, the more of us that switch to organic and GMO free foods, the less costly these items will be. It’s already happening in my local community. Now, I can go to my regular supermarket and purchase a growing range of affordable and even diverse organic foods. I can even find my son’s preferred gluten-free and dairy-free staples there – everything from coconut milk yogurt to lunch meat, breakfast bars, bread, and baking goods. I even save a few bucks when compared to Whole Foods pricing on several items, so this movement is a positive force! Since I’ve gone GMO-free I feel much better. Upon adopting a Paleo diet last Monday, I’ve noticed I feel even better still and I’ve lost twelve pounds to boot. My carpal tunnel hasn’t been acting up and I don’t feel the stiffness and hurt from arthritis in my hands in the morning. I feel a little more alert, more energetic in the day. My nails are even growing – and I haven’t had pretty nails without a professional manicure in over 20+ years! Here’s the truth as I know it: Labeling will not raise food prices substantially. You will not experience massive job loss or hardship as claimed by the Northwest Food Processors Association. I’m calling BS on that entire statement because it’s not correct or verifiable. I worked in the packaging industry for over ten years and I know that it doesn’t take a rocket scientist to add a simple word to a package label. In fact, there are nearly a bazillion ways to identify or label nearly any object. It’s not as hard as they make it out to be, in some cases, it’s simply a revision to a computerized file that prints labels on demand – or even prints the labeling information directly onto a product’s packaging. Others can simply purchase a label applicator or install an industrial ink-jet printer to quickly and easily add this information for the consumer. There are continuous inkjet printers that print in a legible and very small text. Many of today’s successful food producers already have such solutions in place. It’s simply a matter of revising a message in the device’s program. For those companies that may wish to make consumers believe that such in-line production equipment is excessively costly, it’s important that you understand that these solutions range in pricing as low as $3000 and as high as $100,000+. It just depends on the bells and whistles you choose and most food producers already have some form of identification marking system in place for the printing of expiration dates, batch and lot codes, and other required information for food safety. It’s a ten minute programming revision, that’s all. This will not jack up the cost of food, plain and simple. The real problem is that companies like Kellogg’s, General Mills, and Kashi simply don’t want consumers to know that GMOs are present in their foods. They already know how to make GMO-free versions and are already doing this throughout much of Europe. Supporters of I-522 stay strong! Join in the fight and pay a visit to http://www.facebook.com/labelitwa?group_id=0 and give the a Like. I’m with you and am rooting for all states looking to secure this legislation. Learn the truth before you make a decision. Research the issue yourself to understand what lies beneath the hype. entirely, however this post provides pleasant understanding yet. Thank you so much! Please forgive my late response – I’ve been battling computer problems and gearing up for my youngest son’s IEP, oldest son’s graduation, etc. I have a long list of informative articles in development and hope you’ll find them useful and entertaining.